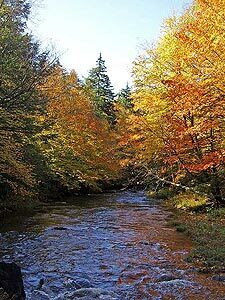 We are a group of avid hikers who enjoy spending time in the magnificent forests and parks of the mid-Atlantic states. Over the years, we have hiked many beautiful mountains and valleys, and founded HikingUpward.com to share what we’ve learned, create a meeting place for people who like to hike, and encourage anyone with an interest to enjoy the outdoors. Charlottesville based Jeff Monroe has been hiking in Virginia for over 25 years, and writes about some of his outings in his blog at www.wanderingvirginia.com. Jeff is current president of the PATC's Charlottesville Chapter, an Eagle Scout and the father of an Eagle Scout, and a former Scoutmaster. Jeff coordinated revisions of the most recent PATC trail maps covering Shenandoah National Park's Southern District and the National Forest's Pedlar/Glenwood District. When not working as an administrator at the University of Virginia, Jeff is often out on the trail with his constant hiking companion, Gracie the Ultimate Trail Dog.